This revolutionary theater was founded by Sir Tyrone Guthrie, a world-famous director who wanted to establish a regional theater in the United States devoted to innovation. Frank Whiting, director of the University of Minnesota Theater, introduced Guthrie to the Twin Cities and to the Minnesota arts community. Together, they persuaded Guthrie to locate his theater in Minneapolis. 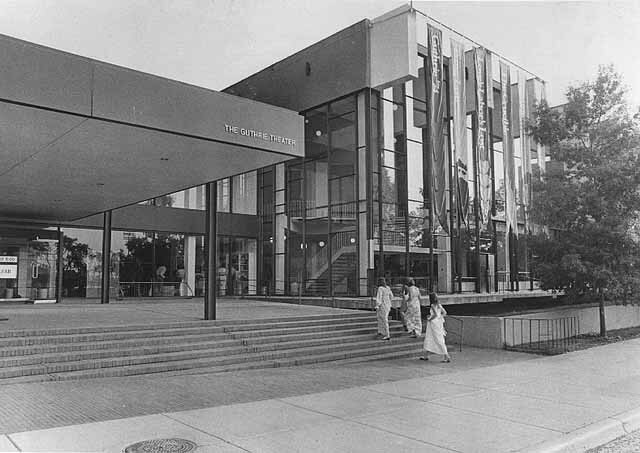 Ralph Rapson, then head of the University of Minnesota School of Architecture, was selected as the new theater’s architect. Both the old and the new theaters were notable for their interior design as well, with irregularly-angled thrust stages that jutt out into the auditorium and for the seating that radiates outward and upward. Action takes place on all parts of the stage and into the seating area, with actors making entrances and exits not only from backstage but also from the aisles and the highest points of the balcony. The Guthrie Theater opened May 7th, 1963 with a modern-dress production of "Hamlet," directed by Sir Tyrone Guthrie. The theater was met with success in its first few years, but from the late 60s to the early 90s the Guthrie was plagued by financial problems. In 1992, however, the Guthrie recovered from these problems in the form of its Campaign for Artistic Excellence, which allotted the theater over 26 million dollars, enabling the Guthrie to renovate its facilities. In the year 2000 Rapson's celebrated architectural creation was threatened with destruction when the Walker Art Center announced plans to expand on land occupied by the theater. By 2003 a solution had been found, as the Guthrie broke ground on its new location near the Stone Arch Bridge in Minneapolis. In 2006 the new Guthrie Theater was completed.